One of the joys of science fiction is imagining landscapes. What would it be like to stand on Titan, for example, a question that was inescapably influenced in my youth by Chesley Bonestell’s wonderful depictions, as well as novels like Larry Niven’s World of Ptavvs (1966) or Michael Swanwick’s novelette “Slow Life” (Analog, December 2002). And then, of course, there were those multi-star skies, as in Asimov’s “Nightfall” (Astounding Science Fiction September, 1941. The Science Fiction Writers of America, incidentally, voted “Nightfall” the best science fiction story written prior to 1965, when the Nebula Awards began. I would bet almost all Centauri Dreams readers are familiar with it, but if not, it’s widely anthologized. So let’s imagine a planet forming in the dust ring, just as we know planets form in the disks we’ve found around single stars. From the surface of such a world, our new science fictional setting shows us the disk as a band rising out of the horizon, with the twin stars moving in and out of the disk plane, so that we get two shadows much of the time. Our circumbinary planet in its all but perpendicular orbit of the primaries might see a scene like the one below. Image: View from an orbiting planet. Copyright: University of Warwick/Mark Garlick. Used with permission. The young system in question is found at HD 98800, also known as TV Crateris, in the constellation Crater, somewhere around 150 light years away from the Sun. This is actually a quadruple star system found in the TW Hydrae association. HD 98800 A is a K-class dwarf probably orbited by a red dwarf, while HD 98800 B is likewise a K-class, red dwarf pairing. 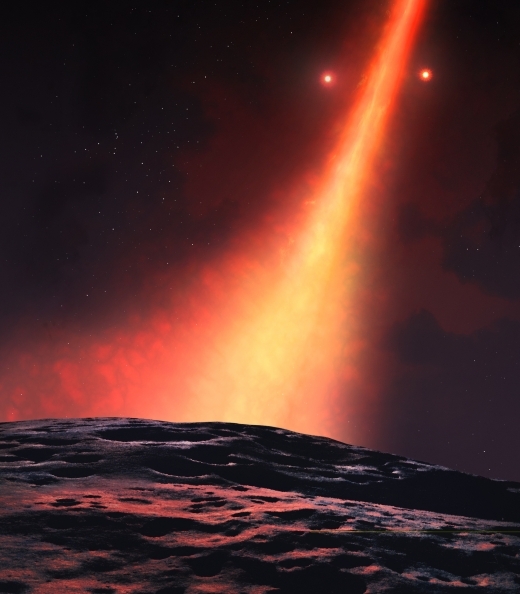 A planet in this system — and bear in mind that this is a very young system, so the planet-forming process would be early — would have four nearby stars to color its landscape. If planet formation can proceed equally efficiently in both coplanar and polar configurations, circumbinary planets on polar orbits are predicted to be nearly as common as their coplanar brethren (although these fractions may be modified by later dynamical evolution). The most eccentric binaries are the most likely to have polar disk configurations, so it is not surprising that the known transiting circumbinary planets, which are near to coplanar, are all in systems with e≤0.52, with 8 out of 9 having e<0.22… Polar disks, and perhaps planets, may be a common outcome of circumbinary disk formation, and provide motivation for systematic searches for both. 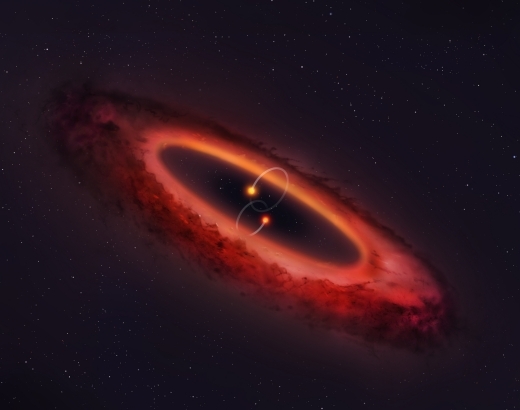 Image: View of the double star system and surrounding disc. Copyright: University of Warwick/Mark Garlick. Used with permission. Is there, then, a large population of such unusually aligned circumbinary planets awaiting discovery? If so, we’ll have a variety of further interesting landscapes to consider, even as we ponder the kind of seasonal variations that can occur on circumbinary worlds circling a wide range of stellar classes and their own possible companions. Plenty of material here for writers, or has some far-sighted SF wordsmith already depicted such a planet? If so, please let me know in the comments. The paper is Kennedy et al., “A Circumbinary Protoplanetary Disc in a Polar Configuration,” Nature Astronomy 14 January 2019 (abstract). We investigate the imaginary world of Kalgash, a planetary system based on the novel “Nightfall” (Asimov & Silverberg, 1991). The system consists of a planet, a moon and an astonishing six suns. The six stars cause the wider universe to be invisible to the inhabitants of the planet. The author explores the consequences of an eclipse and the resulting darkness which the Kalgash people experience for the first time. Our task is to verify if this system is feasible, from the duration of the eclipse, the “invisibility” of the universe to the complex orbital dynamics. It’s fun that someone did this. But they left unaddressed what I would guess to be the other two main sources of implausibility: what kind of orbit would the moon have to have, to cause an eclipse of Dovim only once every 2049 years? And if civilisations are documented ending every period of 2049 years, this suggests that the eclipse of Dovim always occurs when the planet has its night with respect to all of the other 5 stars in the system. Whether both of these are possible is not addressed in the paper. The paper has been posted on the arXiv with a comment containing the rather odd instruction “do not read” – I’m not sure what’s going on there. While this result is suggestive for the existence of misaligned circumbinary planets, the paper does note that once the gas dissipates, any planets that form from the disc around HD 98800 B are likely to find themselves on unstable orbits and either collide with the stars or get ejected from the system. Nooo! Say it’s not so andy! I so wanted this (circumbinary polar orbiting planets) to be a new common thing in the universe! I note that if a disk is stable, can’t a planet(s) form from it that could also perhaps settle into a stable orbit? They further find (if I followed their reasoning) that in binary stellar systems with disks the odds between co-plainer and polar orbits is about 54:46, so almost half of these systems could be forming polar orbiting planets. Also they think the polar planetary orbit orientation becomes more likely with higher stellar orbit eccentricity. They recommend searching, not just for disks, but also for planets with polar orbits in binary systems. Since binary star systems are among the most common systems the numbers of such planetary systems could be enormous, so I think I’ll still hold out some hope that at least some of this type of planet might find stable orbits. I concur, such a system as HD 98800 cannot be dynamically stable over longer timescales. It’s an interesting system to study, and the planets could have very unusual days, seasons and sunsets. Considering the climates of polar orbiting planets in binary (or higher) systems is fascinating. If a planet has a small axial tilt both of its poles might experience summers at the same time, which would occur when the two stars (or stellar groups) are near their maximum separations from the polar planetary plain. Add in more tilt, vary daily rotation rate, increase eccentricity of orbit, etc for endless variety of climates. might tend to stir or pump the disk. So there might be some need to calibrate how much and from whence is enough to generate planetesimals. Should we consider tightly bound binary stars with a surrounding equatorial circum-stellar disks, we have some of the same features to consider. equatorial plane… Does it get any better or worse in the polar cases? To get a circumbinary habitable planet around a M-dwarf+M-dwarf pair, the stars are going to have to be pretty close together due to the close orbit of the planet. The result is that the stars get tidally locked into having short rotation periods. This would likely keep them very active, then add to that the potential for activity caused by the interacting magnetic fields. With a more luminous star (such as a G- or F-dwarf) in the system, you’d probably be able to have long enough binary star orbits that the tidal spindown would put the stars in a less active regime (maybe not if the secondary is fully-convective as such stars don’t switch to a low-activity state until they reach really long rotation periods). Such systems might be friendlier to life on Earth-like planets than single stars, see Mason et al. (2013) “Rotational Synchronization May Enhance Habitability for Circumbinary Planets: Kepler Binary Case Studies“. The M-dwarfs in Multiples (MINMS) survey – I. Stellar multiplicity among low-mass stars within 15 pc. In addition to the importance for understanding the products and process of star formation, companion stars may critically impact planet formation and evolution. A companion star is expected to gravitationally truncate a protoplanetary disc to a radius of approximately one-third the binary star orbital semi-major axis (Artymowicz & Lubow 1994), thereby limiting the amount of material and the region over which planet formation can occur. Determining the population of companions with separations comparable to or less than typical disc sizes of ∼100 au (Andrews et al. 2009) is particularly important in considering dynamical effects on the disc, and nearby stars are ideal targets to probe the disc-sized separation range with imaging. Once planets form, the presence of even a distant companion can alter the dynamics of a planetary system through the Kozai mechanism (Kozai 1962; Lidov 1962). There are indications that some exoplanet systems have been impacted by this dynamical effect (e.g. Wu & Murray 2003), and simulations of early dynamical interactions in star-forming regions have shown that the Kozai mechanism could be induced in up to 20 per cent of field binaries (Parker & Goodwin 2009), subsequently affecting a sizable fraction of the exoplanet population. Determining the binarity of the field population and comparing with primordial binary distributions are critical to determining the fraction of stable stellar systems amenable to hosting planets, as demonstrated recently for G-dwarfs (Parker & Quanz 2013). As the population statistics of exoplanets around low-mass stellar hosts are explored, an understanding of the stellar companions to M-dwarfs represents an important comparison and environmental factor. Thanks for locating that report. It will take a while to assimilate the details, but it is needed background. A few decades ago I used to simulate planetary motions about nearby binary stars to determine effects on formed planets in habitable zones over tens of thousands of years. The restricted elliptic three body problem tended to advance the celestial longitude of periapsis as the eccentricity cycled incrementally (e.g., from 0. to 0.1 and back for something in the Alpha Centauri habitable zone with a 360 degree shift). The increments of eccentricity had to be bounded by some relation to capture zones for the secondary/primary of the binary system; otherwise the planet would escape or be sent on a cometary path toward the star. In very luminous cases such as Sirius and Procyon with white dwarf secondaries, in principle you can achieve planetary stability very close to one companion or another, but the thermal present is not very attractive. As to the past, well, just how do you explain an A or an F star orbited by a white dwarf? A merger of two fainter stars in the past? Such things could even be associated with terrestrial planets and Sun-Jupiter. But then there were cases such as Sirius which would go bonkers in several hundred revs and perhaps the same with Procyon. Alpha Cen A and B? More stability in the latter. With true multi-body simulation over millions of years – your warranty might vary. Of course, this all assumed that the dynamics allowed the planets to form in the first place from planetesimal bodies. In presentation, feedback depended on perspective of modeler. One individual told me of more precise methods to track the failure trajectories. I didn’t think that was needed. Others remarked on predictive relations perhaps such as the Kozai effect – though I don’t think Kozai was looking at such extreme cases in the 1950s. Then, subsequently I have seen a number of studies of the same cases originating at the University of Toronto. If you could get past formation, it seems, habitable planets around A & B Centauri was not beyond consideration, but the R3B problem oscillations made celestial mechanics climate change a big deal. Of course, if all the formulative conditions for planets in binary systems were clearly understood and demonstrated as negated, then we wouldn’t still be searching for examples about Alpha Centauri and elsewhere. But the polar circum-stellar case might prove very interesting too. The Toronto group did look at some out of plane cases, but I can’t recall the harmonics or the survivability bounds. But suffice to say that we now have cases of circumstellar disks and rationale to give their studies more examination. Not by mergers, but by mass transfer. When their orbits are close enough the more massive star will overflow it’s rouche lobe when it swells as it moves off the main sequence, dumping material onto the original secondary. Guess this matter did come up before and we got to the same point. But can you elaborate on the case for Sirius or Procyon? What would their evolution look like in reverse? Nice question wdk. You’ve given me some fun homework, stay tuned for an upcoming answer once I’ve had the time to research Sirius and Procyon. For an earlier condition, let’s assume that Sirius A and B were more tightly bound in terms of mass, there was more but the angular momentum was much the same, allowing for dissipative effects. One big one would be for Sirius B to turn into a red giant. So if it did, it would have had a mass significantly more than Sirius A did than. Now it’s about 2.7 solar masses and B is less than 1? So how much of the mass do we presume was transferred to A from B? Not all of it, for sure. And since that was the case, much was simply lost to space tying the two together more loosely in a 50 year period elliptical dance ( e ~0.5). I had thought that the binaries Sirius and Procyon were much closer together than they actually are, and therefore I had assumed that there would have been much mass transfer. There still may have been some back when the present WDs in these systems where in their Red Giant phases of their evolutions, but the large separations limits how much mass transfer could have occured. When we think White Dwarf we tend to think, ‘this star is old’. However the more massive a star, the faster it evolves off the MS. The stars in both of these systems are coeval (they formed together), but the WDs are more massive than most, showing that they evolved into WDs at a faster rate than most. ejecting mass or – to be on topic – passage through a disk? We’ll probably pick this up again sometime and looking forward to comments from others. Thanks. I agree that much mass from the WDs would have just blown away – this is what forms planetary nebula after all – in the transition from RG to WD. Mass reduction would have to have caused the orbital distances to increase. Probable that the eccentric orbits where there from the start. New binary system showcasing beaming effect found by astronomers. “An international team of astronomers has discovered a new eclipsing binary system composed of an M-dwarf orbiting a main sequence star. The transiting dwarf star exhibits the so-called relativistic beaming effect. The finding is reported in a paper published August 20 on the arXiv pre-print repository. Remember when discussing SETI that a more open look at what was possible for signals of ET, well this is a prime example of just that problem. These systems could be beacons and should be look at with greater scrutiny to see if this is not a natural effect. “The primary component of the system is a slightly evolved main sequence star of spectral type F7V. The star, about 4.1 billion years old, has a radius of approximately 1.52 solar radii and a mass similar to that of our sun. The companion is a dwarf star of spectral type M5V. It is about five times smaller and less massive than the sun. The dwarf is on a nearly circular orbit around the primary star, orbiting it every 5.44 days. The components of the system are separated by approximately 0.065 AU. The authors of the study also provided the details about the beaming effect observed in the system, focusing on its amplitude. “The results show a change in the amplitude of the beaming effect of 35ppm, which account for 50 percent of the observed discrepancy between expected and observed beaming effect,” the paper reads. Supernovae have been considered as another type of natural beacon ETI might use to get the attention of others. Of course the main drawbacks of using SN as cosmic beacons are their unpredictability and their transience. Perhaps we should further consider what a species capable of interstellar travel and colonization may focus on in regards to using beacons. I don’t see any need for anyone, including scientists, to ignore the possibility of extraterrestrial life, including intelligent life capable of building artifacts. The key is to remain skeptical and questioning of any data which indicates these possibilities and to demand the greatest rigor before accepting such an overwhelmingly important event has happened. We can only learn if we continue to explore with open minds. We’ve come a long way: no longer are scientists under the threat of being burnt at the stake. Issues suc as funding, tenure and ostracism which maintain rationality now exact conformity, particularly in the case of “unknown unknowns”. Maybe Nightfall inspired the British movie Pitch Black?